This product is their flagship product. The natural hair loss vitamin ingredients can help with some many things, see them below! Helps nourish your hair follicles for healthy hair growth. The Vitamin B complex is a set of B vitamins that aid in cell nourishment and promote both healthy hair and skin (specifically on your scalp). Promotes a healthy metabolism of oils in the scalp, which prevents dryness. It is also known to strengthen the elasticity of the hair’s cortex, which stops further breakage. Another part of the B vitamin complex. Keeps your hair follicles clear of debris (from dandruff) which encourages new hair growth. A source of sulfur, which is an essential component of both collagen and keratin. Collagen keeps your skin supple, and keratin is one of the building blocks of healthy hair and nails. Composed of small amino acids, hydrolyzed collagen aids in building up the proteins that strengthen hair. A natural source of iodine, which helps support your hair follicles by both regulating their resting time and helping them become active again, which results in new, healthy growth. Stops hair follicle shrinkage, allowing them to thrive and produce healthy hair. 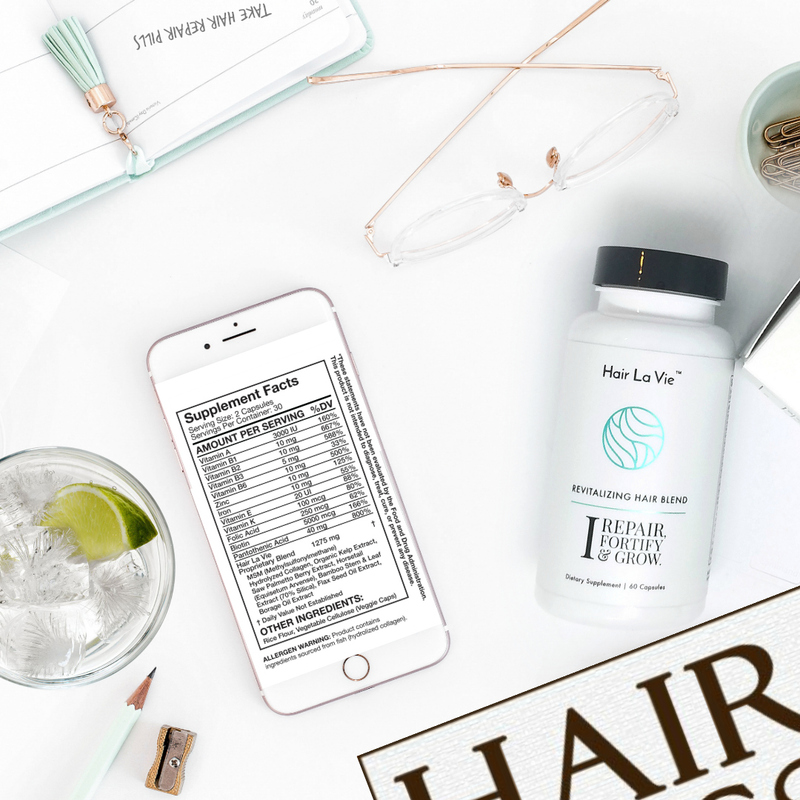 Horsetail is rich in silica, a mineral that has been shown to accelerate hair growth, maintain strand elasticity, add luster, and prevent split ends. The most abundant natural source of silica. In addition to its hair benefits, silica also improves calcium assimilation in your body, which helps build stronger bones and teeth. Contains an omega-3 essential fatty acid that helps maintain healthy hair follicles by regulating the production of sebum oil, increasing the retention of water, providing moisture, and relieving dry, itchy scalp. Includes an omega-6 essential fatty acid that helps reduce the follicular inflammation that often leads to damage and hair loss. 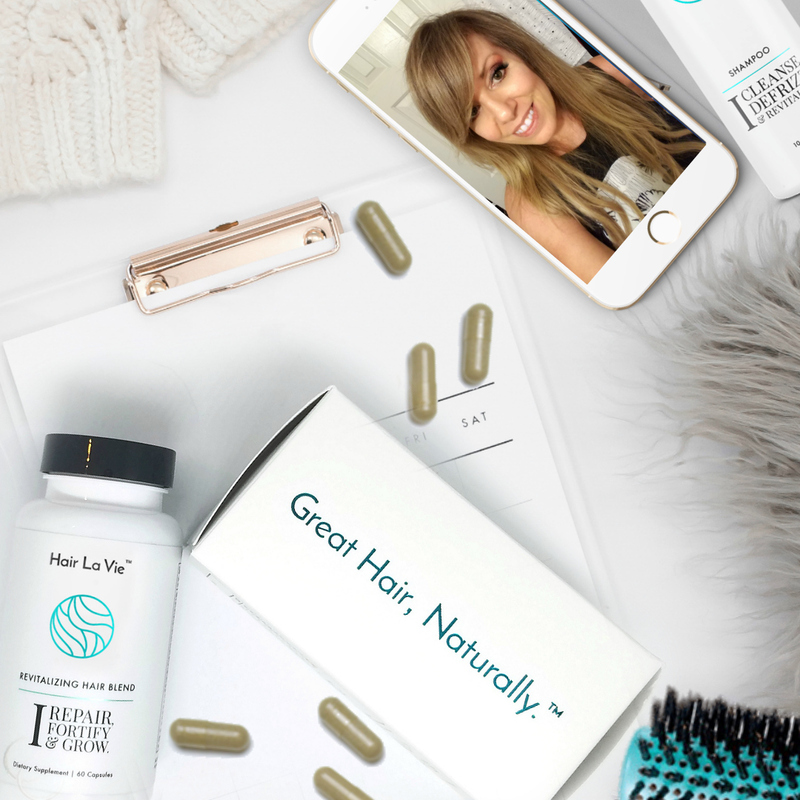 Delivers vital oxygen to the cells and follicles responsible for fast, healthy hair growth. I did just start to use this Hair La Vie product so please stay tuned. I had a friend that tried this that loved it for thickness, so I will let you know in a month, once I finish the bottle. One thing I will say is that is because some of the ingredients are derived from fish collagen, the pill does have a taste. The taste reminds me of eating salmon skin. Additionally, the list of ingredients are amazing, so I am hoping it will help with my skin as well! hair treatments for thinning hair, thicker hair reviews, thicker hair tips, vitamins for thinning hair.